Near the head of Loch Striven, at the outflow of the Glentarsan Burn, there once stood a small loch-side chapel. Nothing is known of its history, nor can we find any saint associated with it. The footings of the chapel walls at Ardtaraig lie in a little wooded enclosure on the loch-side. 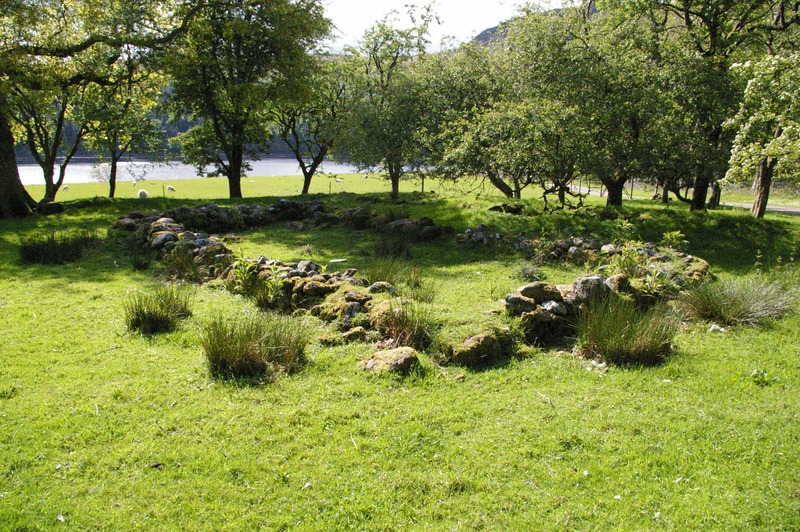 The foundations survive, however, and the footings of the surrounding curved enclosure are still visible . The building was oriented nearly East-West, as one would expect of a medieval chapel site, and under an oak tree beside it stands an early medieval cross-slab carved of mica-schist. The carving is of a simple Latin cross, apparently open at the bottom. 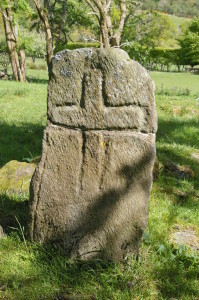 The slab has been broken in the past, along a line which had probably been weakened by the carving of the lower edge of the arms of the cross. But it has been repaired reasonably well. It stands in a break in the line of the chapel’s enclosure. Perhaps it marked the point where a path led vistors from the loch to the chapel, and as they entered the sanctuary through a narrow gateway it reminded them that they were entering a holy place. The ancient cross at Ardtaraig, broken and repaired. For a good Ordnance Survey map of the Ardtaraig and surrounding area including roads and foothpaths, click on ‘View Larger Map’ below. Getting to Ardtaraig from Dunoon. Park your car in the lay-by on the main road (B836), opposite the driveway which is signposted to Ardtaraig. Walk down the drive, through the wood and across the bridge. The chapel is among trees in a field on the right, before you reach the house. There are also several buses a day from Dunoon to the Ardtaraig road-end, and back again – routes 478 and 479. Check timetables before travelling if you want to make sure you don’t miss the bus back! Cyclists can go along the road, as with car-drivers above. For walkers an attractive alternative approach is to start at Inverchaolain and go north along the east shore of Loch Striven. This is an ancient track. There is a road part of the way but on entering the Glenstriven estate the route is not so clear. The track is not signposted and a bit difficult to find if you don’t know the way. It is hoped that signage and track clearance along this route will soon make it more user-friendly.